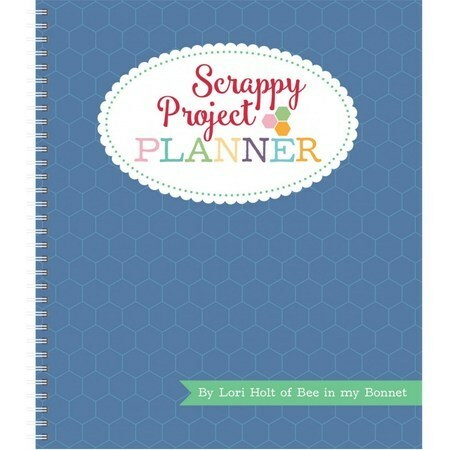 The Scrappy Project Planner by Lori Holt of Bee in my Bonnet is the ultimate tool for the avid quilter. When life = quilting stay organized and inspired by this planner! It includes over 200 useful pages for writing, scheduling, and sketching so, you'll have everything you need plus a few exciting bonuses! Since all the dates are blank you can fill them in yourself and start whenever you want! The Scrappy Project Planner is split into five handy sections: Weekly Planner, My Project Planner, Tips & Organization, Scrappy Planner, and Sketches & Ideas. Stay on top of your busy schedule with colorful pages to help you plan your week, and easily flip through your list of quilting projects. This planner even includes a wealth of information including helpful piecing methods, charts, and diagrams as well as six original quilt patterns by Lori that can only be found here! Bring your own creativity to life with additional graph paper to work out new quilt ideas! The Scrappy Project Planner is the perfect gift for the quilter or sewist in your life!